"Klein's analysis shows convincingly that from research in the sciences to new graduate-level programs and departments, to new designs for general education, interdisciplinarity is now prevalent throughout American colleges and universities. . . . Klein documents trends, traces historical patterns and precedents, and provides practical advice. Going directly to the heart of our institutional realities, she focuses attention on some of the more challenging aspects of bringing together ambitious goals for interdisciplinary vitality with institutional, budgetary, and governance systems. A singular strength of this book, then, is the practical advice it provides about such nitty-gritty issues as program review, faculty development, tenure and promotion, hiring, and the political economy of interdisciplinarity. . . . We know that readers everywhere will find [this book] simultaneously richly illuminating and intensively useful." "Klein reveals how universities can move beyond glib rhetoric about being interdisciplinary toward pervasive full interdisciplinarity. Institutions that heed her call for restructured intellectual environments are most likely to thrive in the new millennium." "In true interdisciplinary fashion, Julie Klein integrates a tremendous amount of material into this book to tell the story of interdisciplinarity across the sciences, social sciences, and humanities. And she does so both from the theoretical perspective of 'understanding' interdisciplinarity and from the practical vantage of 'doing' interdisciplinarity. 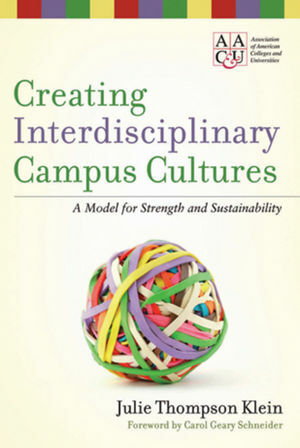 This book is a must-read for faculty and administrators thinking about how to maximize the opportunities and minimize the challenges of interdisciplinary programming on their campuses." Julie Thompson Klein is a professor of humanities in English and interdisciplinary studies at Wayne State University in Detroit, Michigan. She is past president of the Association for Integrative Studies (AIS) and former editor of the AIS journal, Issues in Integrative Studies. Klein consults widely both nationally and internationally and is the author and editor of many books, including Interdisciplinarity: History, Theory, and Practice; Crossing Boundaries; and Humanities, Culture, and Interdisciplinarity. She is also associate editor of the forthcoming Oxford Handbook on Interdisciplinarity. The Association of American Colleges and Universities (AAC&U), headquartered in Washington, D.C., is the leading national association concerned with the quality, vitality, and public standing of undergraduate liberal education. Founded in 1915 by college presidents, AAC&U now represents the entire spectrum of American colleges and universities—large and small, public and private, two-year and four-year. AAC&U comprises more than 1,200 accredited colleges and universities that collectively educate more than seven million students every year.